We all have psychological blind spots, aspects of our personalities that are hidden from our view. My own tend to boil down to fears that feel too threatening to acknowledge, and so are easier to tuck away. This is why I’m deeply grateful for Sufi practices that bring these distortions into conscious awareness through zikr, the repetition of Divine Attributes. I often linger on the line in the Mevlevi Wird that offers an antidote for approaching my phobias: “Facing all fears, (say) ‘there is no god, but God.’” These words, La Illaha illa Allah, have been part of my life since I was a child, yet only since moving away from the religious understanding has the immensity of their spiritual significance unfolded for me. In my impression, the six words have been usurped by religious authorities to divide people based on those who worship one supreme lord, and are thus bound for “heaven,” and those facing a more sinister fate because they worship a collection of gods. This superficial interpretation is dangerous because it keeps our focus outside, leaving us prone to fixating on comparing ourselves to and judging the actions of others. What is more meaningful and ultimately more challenging is to witness our interior world and all the false “gods”— the contradictions, obsessions and preoccupations — that consume our attention. Welcoming La Illaha illa Allah into my days for a few years has brought to light the crowd of idols within me, and it’s bigger than I care to admit. From the sometimes debilitating desire to be acknowledged and validated, to more subtle idols, like the tendency to speak to myself in a self-deprecating way, the zikr has opened a gateway to my shadow side. My experience is that zikr works on an incredibly subtle level and is a gradual unfolding, like a germination process for the spiritual heart. At first, it didn’t feel like anything was happening; I had to trust that this seed I was planting in my inner world would eventually blossom. Through the tears welling up in my eyes, I looked down at the opening and closing of my hand. First I wrapped my four right fingers over my thumb and pressed them against the centre of my palm into a fist. I examined it for several seconds, then slowly released the fist until my fingers were outstretched. For a few moments more, I gazed at my open hand, before closing it again. After several minutes I started to sync the motions with my breath so I inhaled as the fist closed, and exhaled as it opened. With every in breath I silently repeated Ya Qabid (The One Who Constricts), one of the 99 Qualities of Allah, understood as the Divine Reality in the Islamic Sufi tradition. 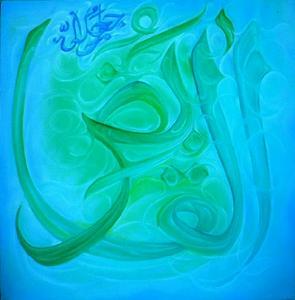 With each out breath, Ya Basit (The One Who Expands Our Hearts), emerged in a whisper from my lips. I concentrated on this meditation long after the sobbing had ceased, mesmerized by the incredible workings of the human body. Rumi’s poetry frequently references the harmony between expansion and contraction. In a physical sense, it keeps us alive: the rise and fall of our diaphragms brings forth breath and the heart constricts and expands to move blood through our veins. And yet, when it comes to emotions, how often in life have I clung to joy and sought to prolong it, and deemed pain as “bad” and sought to keep my sojourn in grief and sorrow as brief as possible. In my meditation, a more visceral understanding of the importance of accepting the difficulty and ease of life with equal graciousness settled into my heart. Surely after the closing of your fist comes the opening. the owner would be crippled. They are as necessary to you as two wings are to a bird. Working with Divine Names like Ya Qabid and Ya Basit has been transformative for my spiritual practice this year as I engage with some old psychological wounds that had been buried in the depths of my subconscious. In the Sufi tradition, we understand the Names as Qualities of Reality which we can activate in ourselves by consciously holding them and allowing their essence to unfold within us.